Canada has considered as a dreamland for numerous skilled individuals especially from developing nations. With better employment opportunities as well as individual’s career growth, the country is a place for those who are in seek of rewarding quality life and handful salaries. Canada tops the chart of leading immigration destinations and it is one among those nations, who have first introduced immigration programs against Point Based System. It also offers a great choice of visa and immigration programs for self-employed, employed as well as businessmen categories. Canada is aimed at welcoming more skilled immigrants to migrate and work in Canada. 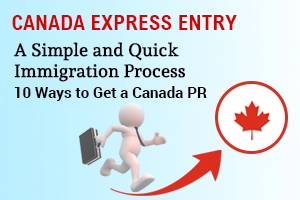 Thus, it has launched a new immigration system entitled as Canada Express Entry, which has started its operations from 1 January 2015 onwards. Federal skilled worker program is structured for overseas professionals who hold required qualifications, skills or experiences to fill the skill shortages in Canada and contribute to the country’s economy. Canadian Experience Class is designed for overseas nationals who have resided in Canada for a certain period and have relevant skilled work experience, good command on English and French language skills, as well as adopted country’s culture.